The south coast PFI RF switching has similar functionality, although it is from a different supplier. In Farnham, over 60 years of service by Revo columns like these on Hale Rd/Farnborough Rd will soon be coming to an end as yellow crosses have appeared on the columns. Meanwhile in Guildford, the master (branch) nodes for the Harvard system are being fitted to pre PFI main road columns. These roads don't have new installations, and I assume it is an attempt to improve the coverage area of the master nodes by having them at an increased height to control the leaf nodes in surrounding residential areas where there are new installations. I spotted a couple of areas in Guildford where this has been done, and also the same technique used in Staines. That is sad news. How likely is it you'll be able to save the lantern and bracket? Well anything is possible, but you really need to save the top of the column as well as the bracket. If they have a Sthil saw they would be able to cut the top section off. Possibly a donation to the beer funds may help to seal a deal with the crews. It'll be a shame if it did go but if someone could preserve it - fantastic. This is the type where the bracket arm is welded to the top of the column.... the bolts on the staybar and under-support can be cut through with a petrol saw as only about 4mm clearance is needed between the metal plates. But if just the bracket was saved, a metal plate could be used to have the main tube welded to it for a rather nice (and big) wall bracket. New columns are being installed on the A31/A325 roundabout in Farnham. The west side already has some new columns and today new 12m columns were being installed on the NE side. As the RF nodes on the new installations have not yet been mapped onto the system, they are at the moment dayburning. Most of the roundabout is actually fed from a feeder pillar so is considered on a "private" supply. Work starts soon on the 6 Bells Roundabout, slightly further north and on the Farnham bypass to the east. Work is now just about complete at the A31/A325 Shepherd and Flock roundabout in Farnham - this includes around 6 new columns ( 1 for 1 replacements) at the eastern exit of the roundabout onto the A31 to Guildford. Work is now also complete on the eastern section of the A31 Farnham bypass. Initial excavations have been made for new installations at the 6 Bells roundabout. Work in Farnham has seen replacements complete on the A325 around the 6 Bells roundabout which has meant the demise of this impressive double bracket from the 1970s. Sporting ZX3s, it would originally had 135W SOX lanterns probably Eleco GR150s. 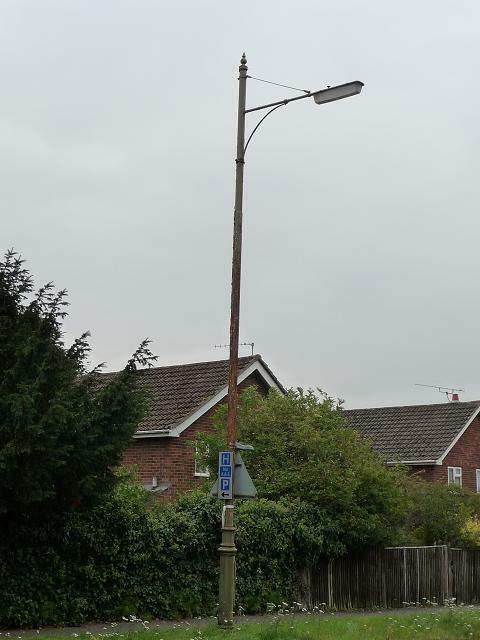 The replacement is also a double bracket column, but with shorter arms, and a far more utilitarian appearance, fitted with the ubiquitous Arcs running SON.